The festival went on for several years before flaming out in 1997, but former Jane’s Addiction frontman Perry Ferrell, who founded Lollapalooza, never gave up his dreams of bringing it back. His first attempt to revive it, in 2004, ended in failure, when it was canceled due to a lack of ticket sales. After that false start, the decision was made to convert it from a touring festival to a one-time, three-day concert event in Chicago’s Grant Park, much in the same vein as Coachella or Bonnaroo. 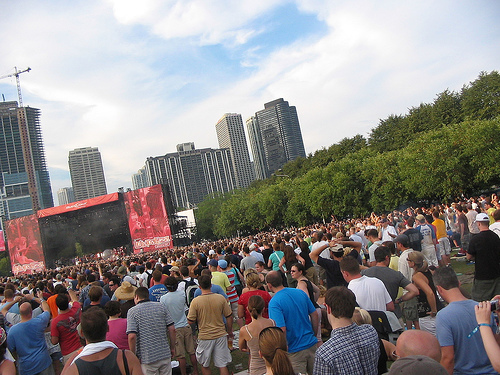 In 2005, 65,000 people turned out for the revamped Lollapalooza, including myself. It was a great experience. Where else can you see Billy Idol, Liz Phair, Primus, The Pixies, Cake and Weezer in the same day? The festival grounds barely covered half the park. I remember sitting on a hill, in the middle of all the action, and being able to see both stages at the same time. It was like a strange variation of dueling pianos. At one point, Anton Newcombe, of The Brian Jonestown Massacre, starting yelling across the way to the very emo musical act, Dashboard Confessional. “That’s the best argument for abortion right over there,” he shouted. By 2006, the number of attendees had skyrocketed to over 170,000, thanks to acts like Kanye West and The Red Hot Chili Peppers. I returned that year and it just wasn’t the same. The stages were miles apart and the crowd seemed like a pulsating mass of introverted, humorless people (except for those at the amazing Manu Chao show; they were energetic and fun). Ever since then, Lollapalooza has kept growing and growing. The attendance for this year’s festival consisted of over 225,000 concertgoers. And it looks like things went off without a hitch, that is if you discount the rain, which converted much of the festival grounds to mud, the sweltering 90° temps, and the death that occured (reportedly from natural causes). Musical highlights and crowd favorites included sets from The Killers, The Yeah Yeah Yeahs and Lou Reed. Snoop Dog even showed up in the final hours! In the clip below, Chicago Tribune music critic Greg Kot reviews day three.